"I've seen the future of tap dancing and it looks like Michelle Dorrance. 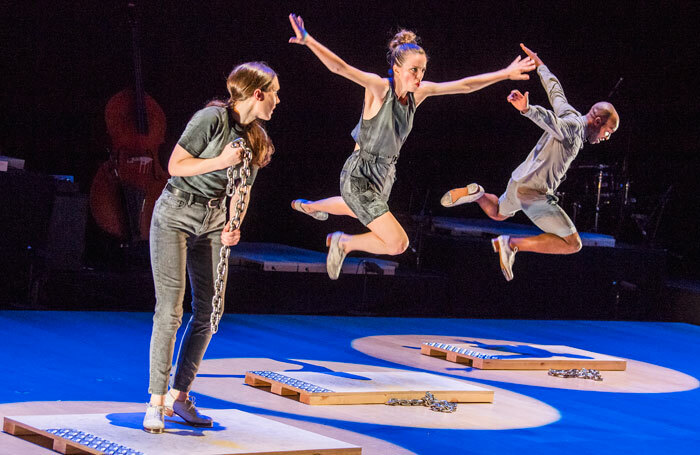 Her Dorrance Dance company is at Sadler's Wells until Saturday and putting on a sensational show – one that emphasizes tap's possibilities as a creative, artistic form, without ever sacrificing its ability to thrill and excite." "There’s plenty of engaging, satisfying groove to enjoy, and the clubby finale — tap dance meets deep house — shows that tap definitely has a future beyond Hollywood nostalgia." "The varied sequences are individually stunning - technically innovative with room enough for improvisation. Whether dancing in unison, in duets or solos, Dorrance’s tap troupers are coordinated without uniformity." "There’s an irresistible collective spirit to this company, too. When they’re all performing together, the stage becomes clamorous with cross rhythms, counterpointed phrases and laughter. The rocking finale, in which all eight dancers are joined by all three musicians, has the audience on its feet."